There has been a lot of hype in the past few years over this little Cambodian restaurant in Chinatown. 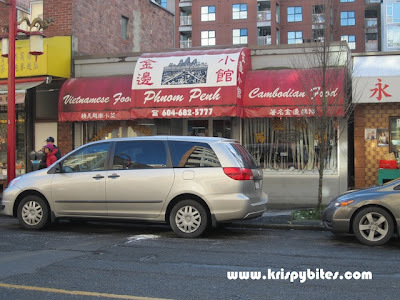 I had never been there myself, but my boss from an old summer job went there often for takeout. I still remember the delicious fried chicken wings she used to bring in to the office. So when Janice (Good Eat) and Kirby (Eating with Kirby) suggested this place for our meetup, I was excited about trying the wings again after so long. I was also curious as to why the restaurant had become so popular. As we were waiting for the food to arrive, we were given bean sprouts and a couple of sauces for our noodles. 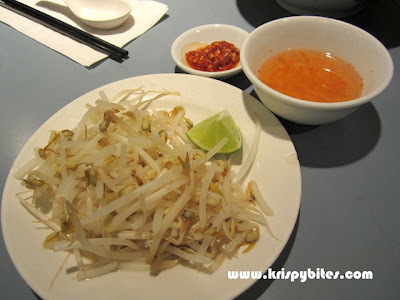 We got a very small portion for 3 people, but it was enough for us since I don't like the taste of bean sprouts and usually eat my food without too many condiments. 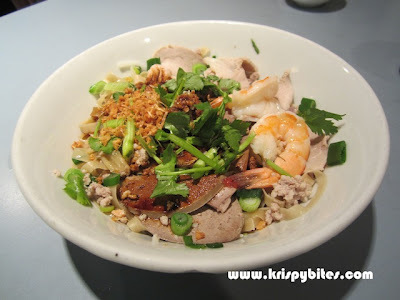 The first dish we had was the Phnom Penh dry egg noodle (金邊乾撈麵) ($6). We got the broth on the side, so we could taste the two separately. 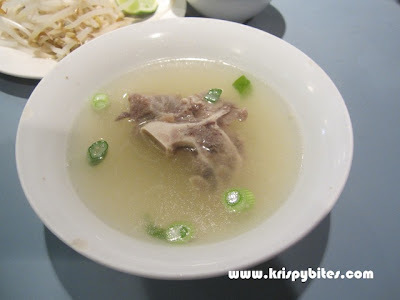 I took a few spoonfuls of clear broth and was amazed at how flavourful it was. How could it taste so strong despite being almost transparent? The answer is... MSG — a recurring theme throughout the meal. The noodles were also very strong in flavour and very salty from the soy sauce. They were tasty, but I'm generally not a fan of cold noodles and toppings. 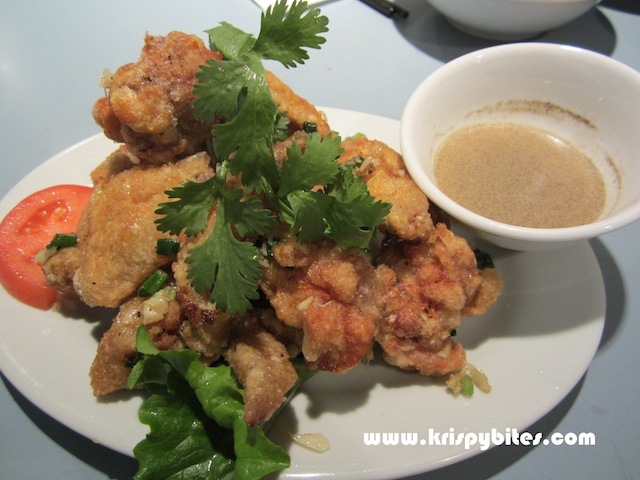 The Phnom Penh deep fried chicken wings (金邊酥炸雞) (1/2 order: $7.95) is the #1 must-try dish according to most reviews out there. They were just as I had remembered them — crispy, golden, and loaded with MSG. They were delicious, there was no denying it, but that was because every single wing was completely covered with MSG. Seriously, I could actually see the white specks. A lot of them. The pepper lemon juice that came with the dish also enhanced the taste of the wings. The resulting flavour was salty, sour, peppery, savoury, and slightly sweet (from the MSG). It was like an explosion of flavour that was so overwhelmingly intense that I'm not sure I would enjoy it on a regular basis. Another must-try is the marinated butter beef (牛片焗蒜油醋) ($12.85). Kirby suggested this dish, but I don't think any of us expected it to be so raw. 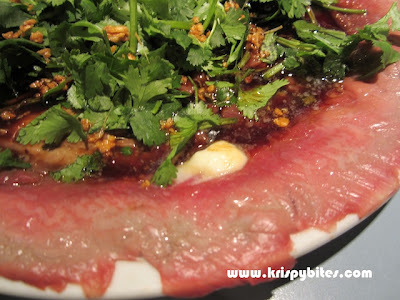 Other than the slightly browned meat on the outer rim, the rest of the meat was completely raw. As in right-off-the-cow bright red raw. 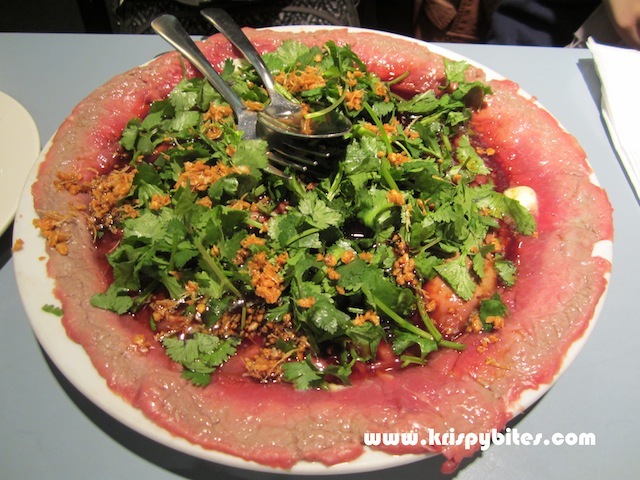 A good thing for a raw meat lover like me. There was a lot of cilantro and roasted garlic on top, along with a very generous amount of savoury vinaigrette. Just like the chicken wings, this was so intense in flavour that I had a hard time enjoying it. It tasted great, but I felt like my taste buds were being overloaded with input. 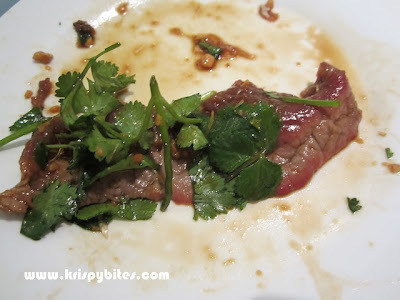 The most convenient way to eat it was to take a small piece of beef and wrap some cilantro and garlic inside. 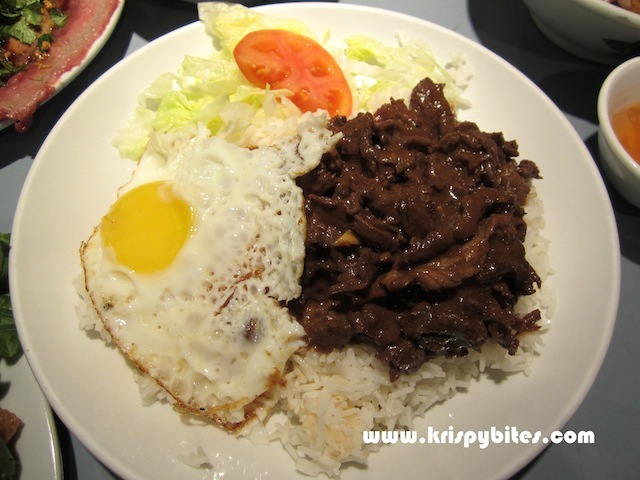 Must-try #3 is the filet beef luc lac on rice with egg (牛肉LucLac飯加蛋) ($9.50). Compared to the other dishes, this was less intense because of the rice and salad, but the meat was by no means mild in flavour. It tasted so creamy that I thought it must have been cooked in butter. While the beef was good, I don't understand why this is a must-try dish because I found it very common and unexciting. It was just a typical Chinese rice plate with tasty meat, a regular fried egg and a sad excuse of a salad. Service was non-existent as the place was packed all morning and well past noon with a consistent line-up at the door. All of the servers looked really grumpy as if they'd really like to get out of there as soon as they could. Seating was cramped because they tried to stuff as many tables as possible into the restaurant. The food, delicious as it was, completely numbed my taste buds and I found myself drinking one cup of tea after another in an attempt to wash out the MSG coating my throat. All of that butter and seasoning couldn't have been healthy either. I'm still glad I tried the place out because the food was intensely tasty, but this is definitely not a place I'd want to revisit any time soon. The dry noodles 乾撈麵 should have been warm, not cold, and the soup always comes on the side, sometimes with a bone, sometimes not. Yup, MSG wings, we Chinese love MSG...hahahahaha! Another signature of theirs is the oyster pancake.